Ecoglo® uses a patented process to produce a range of products that provide solutions for your pathfinding needs. 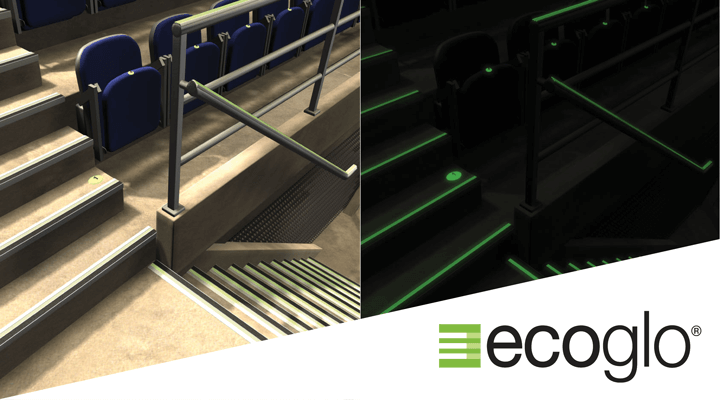 Ecoglo® provides step edge contrast while increasing slip-resistance and it is visibile in all light conditions. Our patented process bakes in the photoluminescent powder and non-slip material making Ecoglo® tough enough to pass internationally accredited laboratories relating to durability, weather resistance, UV resistance, stain resistance, abrasion and cleaning. Ecoglo® products are designed to be a part of a complete safety way guidance system. Photoluminescent safety way guidance is the safest most effective way to ensure evacuation of your facility in event of black out. Protect against slips and trips.